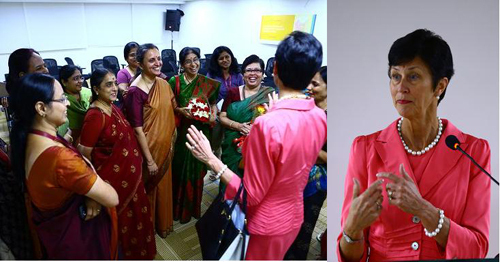 eWIT was invited by iNautix for an event organized by them on opening of Pershing India (A BNY Mellon Company) at Ramanujam IT City in Taramani and gave a talk on ‘Improving the share and sustainability of Women at Leadership Levels’. Ms. Karen Peetz , President, BNY Mellon addressed the gathering. Ms. Vijayalakshmi Rao, Advisor, eWIT spoke on ‘Improving the share and sustainability of Women at Leadership Levels’ in Indian context.